Justin Quek visited the beautiful Kagoshima prefecture in Japan last year and loved it all. 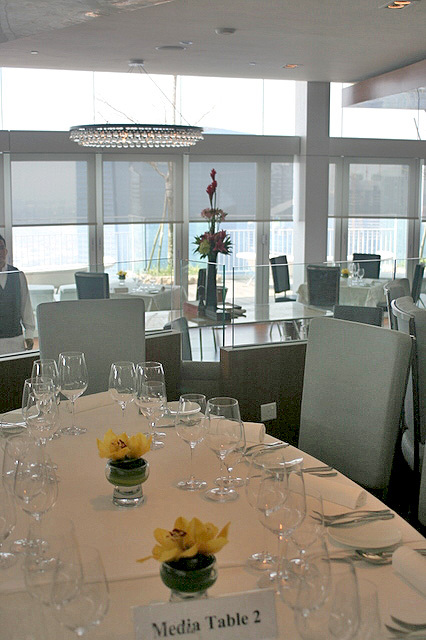 He's incorporating some of their best marine and farm produce into his cuisine at Sky on 57 as it goes into its second year of operation at the Marina Bay Sands. 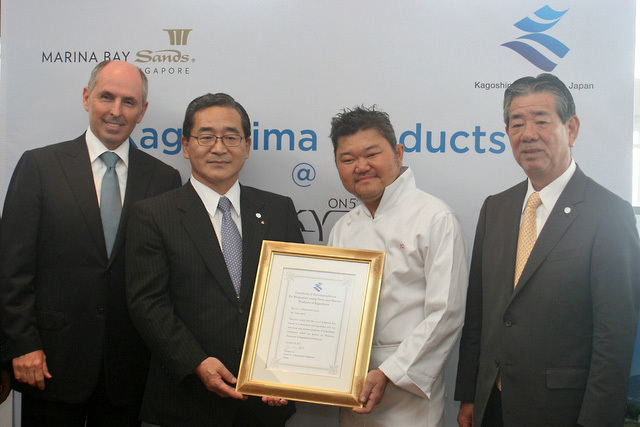 For his support, Chef Justin Quek received a Certification of Recommendation from Kagoshima Governor Yuichiro Ito. This is only the second time such a certificate has been presented (the first one went to a five-star hotel in Hong Kong last year). To mark this event and to welcome the Chinese New Year (CNY), Chef Quek will be presenting a special five-course menu (S$138++) inspired by the various products from Kagoshima. The menu will be available for from 17 January to 7 Feb 2012. 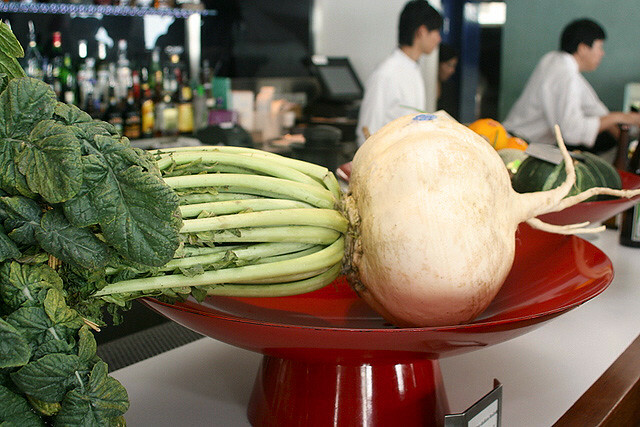 Some of the produce are real eye-popping wonders, like this enormous Sakurajima Daikon. Sakurajima is an active volcano at Kagoshima Bay. I think it's that mountain in the background of the first picture. Kagoshima is so beautiful, I want to go there too! The supermodels of produce. 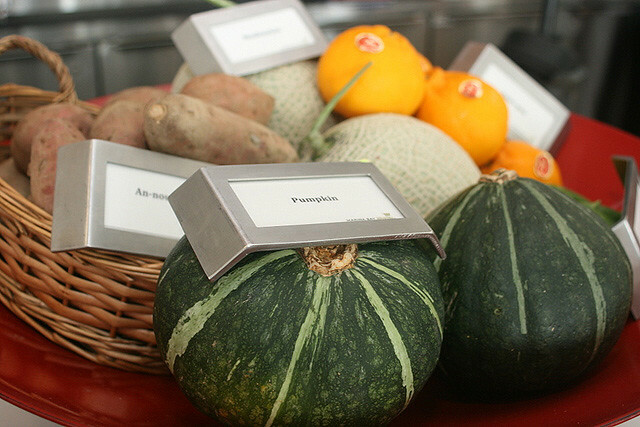 Vegetables from Kagoshima. 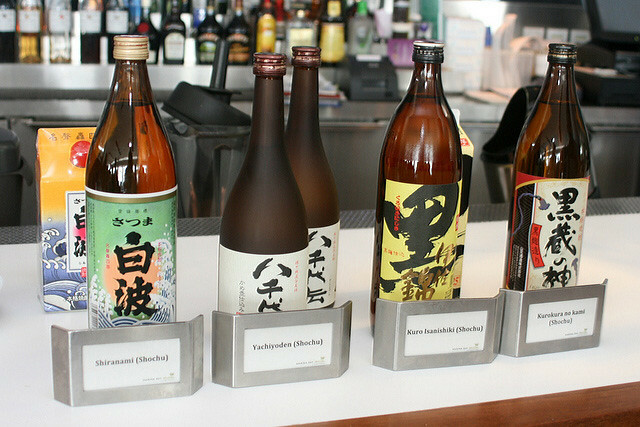 Various Shochu labels from Kagoshima. At the press luncheon, we were treated to some dishes that are in the CNY menu. 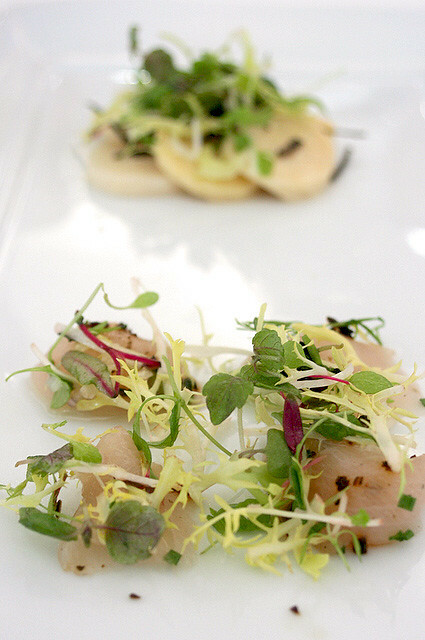 We started off very well with the Ceviche of 'Buri-OH' marinated in lemon dressing (foreground) and Steamed bamboo Shoots in Truffle Dressing with Micro Greens. Buri is Japanese amberjack, and is refreshingly sweet. The lemon dressing is a perfect match. You'll find a variation of this in the CNY menu - Prosperity Salad with Sliced Buri-oh fillet and jellyfish. 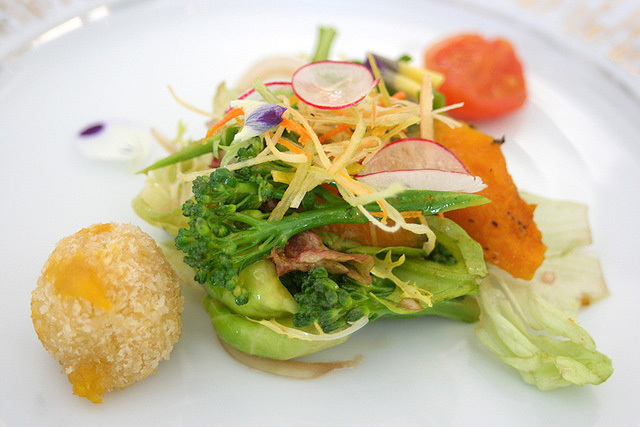 Spring Salad with Kagoshima Vegetables - sweet potato and cheese croquette, snow peas, fava beans, fried leeks and grilled pumpkin. Amazingly fresh and beautiful. I love the croquette. What a lovely combination of cheese and sweet potato, and it wasn't oily at all. 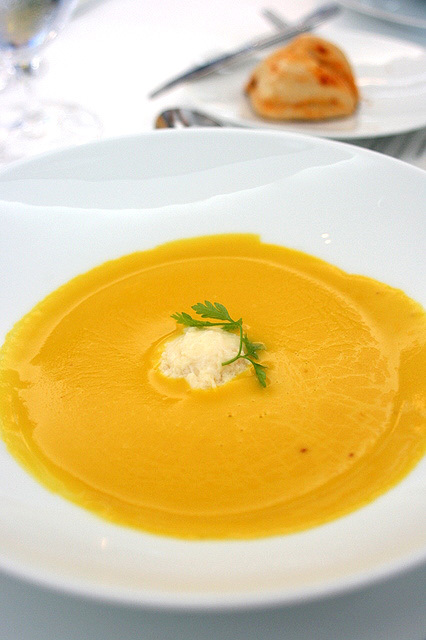 Organic Kagoshima Pumpkin Veloute with Crabmeat Custard - smooth and very savoury. The crabmeat custard is interesting. It almost tastes like very tender half-boiled egg white. Goes well with the breads here, which are excellent, by the way. The highlight however is the Kurobuta pork. Oh, the wondrous little black pig. 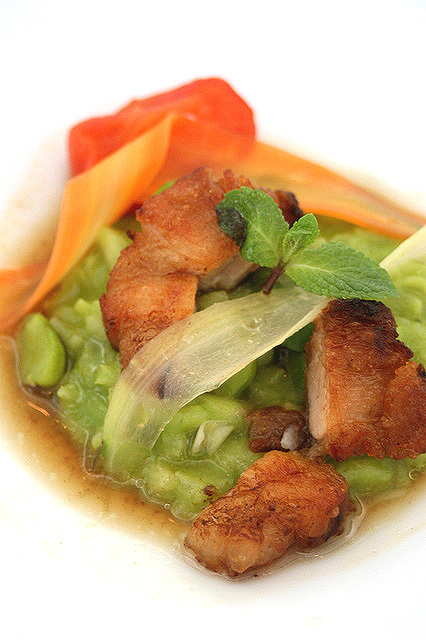 Grean Pea Risotto: Sauteed Kagoshima Kurobuta Confit, Green Pea and Bacon, Natural Meat Jus (extracted from pork bone). Kagoshima exports some of the world's best kurobuta, and it is very evident here how good it really is. The surface is seared to a gentle crisp, and the juicy fat and tender meat inside is absolutely divine. Sweet and clean-tasting. My last meal on earth - yes, can I have this please? This dish is in the CNY menu too, as is the wagyu below. 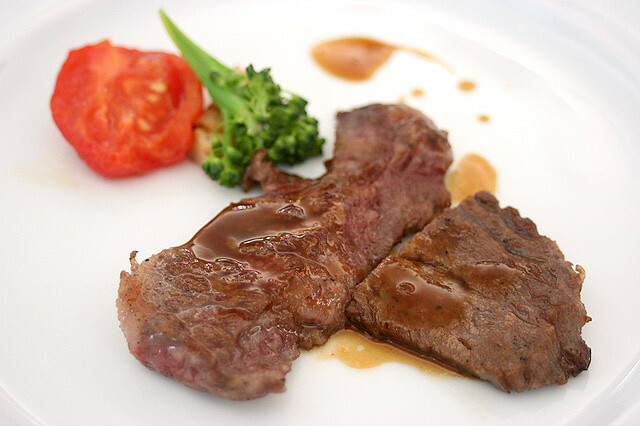 Kagoshima Wagyu: Grilled Minute Steak with Kagoshima Vegetables. Kagoshima also has very good wagyu, and the robust flavours here will thrill your tastebuds almost as much as the kurobuta pork. 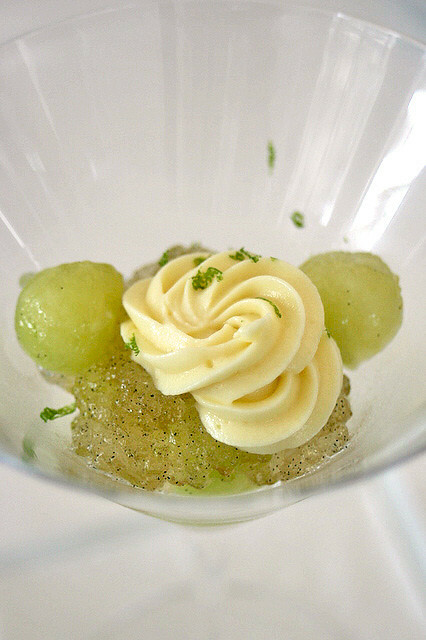 Dessert was Chilled Musk Melon and Mousseline and Sauternes Jelly. The natural sweetness of the fruit was allowed to come through in this. It's not just the food that's pleasing. Feast your eyes on the unbeatable view from the top of Marina Bay Sands. Sky on 57 is very open and spacious, designed with dynamic flowing forms. It's my first visit, but won't be my last, given that Chef Quek will continue to use Kagoshima's produce in his dishes even after the promotion. Warmest thanks to the Marina Bay Sands team for inviting me to the press luncheon. Timing: haha, isn't CNY a special occasion itself? I know, it's a lot of dough for most people. I want to go back very much, especially for the kurobuta. Oh, I've just been informed the menu is only available for three weeks. Dates updated above. I love CNY festivals! and you are making me wanting to taste everything from these photos!!! Happy New Year and Good Luck for 2012 !